This is sad news, but Vintage NY (a wine shop that sells only NY wines) has closed the doors of its SoHo location, and the neighboring NY wine-only wine bar. Emails to one of the owners has gone unreturned, but as I can get more information, I'll share it. For now, the other location remains open, as does their Rivendell Winery location upstate. "Sadly it is true that we have been forced to close our Soho operations. Our closing one of our locations, however, is not a reflection on the NY wine industry's vitality - it is really a sign of the times; rising rents, exhorbitant ancilliary business costs, terrible margins, a declining neighborhood - the list goes on. Please make it clear that we are putting all of our efforts iinto our Broadway location, and that Vintage New York remains commited to promoting the NY wine industry. " This month's New York Cork Club shipment is one of my favorites. Two rieslings from two producers in two different New York regions. Both from the same vintage. First, we have Fox Run Vineyards 2006 Reserve Riesling ($30), a tremendous example of American riesling. 2006 was a terrific riesling year in the Finger Lakes and this one captures that quality extremely well. The nose offers stone fruit (think peaches and apricots), hints of tropical fruit and citrus. On the palate, its gentle sweetness is balanced beautifully by lively acidity, with pineapple and peach flavors accented by a squirt of lime juice and an interesting ginger-spice note. This wine is one reason that Fox Run will be named one of the world's Top 100 Wineries by Wine & Spirits Magazine in their November issue. Secondly, we've chosen Peconic Bay Winery 2006 Riesling ($17) which hails from from Long Island. Floral aromas lead on the nose here along with those of ripe pears and lemons. Secondary aromas of pineapple and even a little petrol add complexity and personality. On the palate, it's a bit bigger than the Fox Run with loads of ripe, juicy pear and citrus flavors balanced by tongue-tingling, minerally acidity. The clean, lingering finish is highlighted by a citrusy-floral note at the very end that invites sip after sip. The New York Cork Club really is a one-of-a-kind wine club. Each month, I pick two wines that I'm really enjoying and my partner in the venture, Greene Grape Wine Company, tracks them down and ships them to our members. Sometimes I pick wines because they are just plain delicious, but it goes beyond that. I'm lucky to have access to wines that most wine clubs do not (because of my relationships with New York producers). You won't find these wines in any other wine club. And, you know that I'm picking wines because I enjoy them... because I don't make a penny on this project. Check it out today and if you'd like to see our past selections, you can see those as well. Morgen McLaughlin, president of the Finger Lakes Wine Country Tourism Marketing Association, sent me a note last night telling me that Dave Whiting, winemaker at Red Newt Cellars, is doing a harvest blog for the Wine Specator this harvest season. Unfortunately, you need to be a paid subscriber to see the blog (beyond a free trial anyway) but for those of you with memberships, you should check out the blog. If only we could get more winemakers from New York blogging, on WS or otherwise! Last Thursday, I took part in the the third edition of Twitter Taste Live event, hosted by Bin Ends, and it was just as fun as the previous edition. For those who don't know, TTL is a virtual wine tasting even conducted via Twitter. Basically, bloggers and other wine lovers get their hands on the same set of wines and taste them together online. This time around, the wines came from Michel-Schlumberger in Sonoma County, California. The co-host was wine blogger Megan of Wannabe Wino. 2006 Chardonnay "La Brume" ($29.60): This one really wasn't much to my liking. It wasn't your stereotypical flabby CA chard, but there was a bit too much buttery character here. Nice tree fruit flavors and the oak didn't seem over-blown, but that butter was just a bit too much. 2005 Syrah ($22.40): This was one of my two favorites of the evening. It had beautiful, delicious dark fruit flavors -- blueberries, blackberries and black plum -- with black pepper spice and a little vanilla. That may make it sound a bit like a fruit bomb, but it's not. 2004 Merlot ($22.40): This, along with the chardonnay, just didn't hit my palate right. There was gobs of cherry flavor with vanilla and leather, but it was pretty simple and a little too jammy and plush. Good, but I like a bit more elegance in my merlot. 2004 Cabernet Sauvignon ($33.60): I know that I say a lot of not nice things about CA cab, but this one really impressed me. Blackberries, brown sugar, pepper spice and firm, but not harsh tannins. As it opened up over the course of the evening (and even the next day) brown spices really emerged. They kind of reminded me of Chai tea spices. I'm talking to the folks at Binends about hosting a future event with some New York wines, so if you're a New York winery and are interested in taking part, let me know. Osprey's Dominion Vineyards is a North Fork producer that just doesn't get enough credit... and I'm not sure why. Actually, that's not true. I know exactly why, I just don't necessarily agree with the reasons. Winemaker Adam Suprenant makes a great value sauvignon blanc, one of my favorite Long Island pinots in recent memory, and consistently good (and often better than that) Bordeaux variety reds. Those are the wines that I think of when someone asks me about the winery. They deserve the attention and the focus. But to many, wines like ODW's Strawberry Wine, Spice Wine, Peach Wine and Richmond Creek line are what come to mind. Pity. I'm not really interested in those wines either, but people shouldn't let those lesser wines distract them from the good things happening at Osprey's Dominion. In doing so, they are missing out on some real gems... like this Osprey's Dominion Vineayrds 2005 Reserve Merlot ($35). Most wineries say that they only make "reserve" wines in the best of growing seasons, but Osprey's Dominion, at least when it comes to merlot, actually follows through on that statement. This is only the second time Suprenant has made a reserve merlot, the other being from 2002. The nose on this still-young red is a little taut at first, but just a little swirling helps release beautiful ripe cherry, plum and blackberry aromas that mingle with vanilla and mint notes. From the first sip, I was impressed by this wines mouthfeel... silky with dusty, ripe tannins that bring great structure without being astringent. The fruit is ripe and forward here, but this isn't a fruit bomb. That minty character from the nose shows up on the mid-palate and carries through a medium-long finish. This is a wine with many great years ahead. For now, decant it for at least an hour, probably longer. Writer David Schildknecht has reviewed some New York wines for the August issue of Robert Parker's Wine Advocate, with several wines scoring well once again. You may remember that Schildknecht rated many Long Island wines highly a couple years ago, so this isn't the first time he's come away impressed with New York wines. I really enjoy Schildknecht's writing and of all the critics out there, his is more like my own that anyone else I think. It's great to finally start seeing New York wines consistently get to the 89-90 level which, if you ask me, is really the same except for the marketing opportunities. Hopefully soon we'll start seeing some consistent 92 to 95-point scores. The potential is there. Just a few notes this morning, though I think you'll be seeing more about the first two items here on LENNDEVOURS this week. The kudos for Finger Lakes Region riesling just keep coming, this time in a report by James Molesworth of the Wine Spectator. Several wines did well, even if personally, I've found the 07 rieslings inconsistent. It was a super hot year in the region and some of the trademark acidity seems to be missing from some wines. I'd point you to the WS piece online, but I don't expect you to pay to read it. 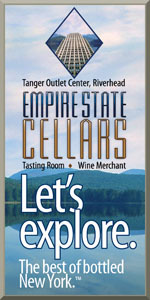 Instead, you can read the highlights on the Finger Lakes Wine Country Travel blog. I'm glad to see that Ravines Wine Cellars is on the top of this list. I really liked that riesling too... enough that I included it in last month's New York Cork Club shipment. Of course, it has to be frustrating to Finger Lakes winemakers that WS still refuses to rate even their best riesling as a 90 or above. Other glossy magazines have recognized the region's quality, but WS refuses too. It's curious, really, given that most the rest of the wine world knows that America's best riesling is being made in the Finger Lakes. Mark Miller, founder of Benmarl Vineyards in the Hudson Valley region of New York, passed away at the age of 89 earlier this month after being sick for quite some time. Miller is considered a pioneer in the region. He founded Benmarl in 1957. You can read more here. Fellow blogger, and friend, Richard of The Passionate Foodie spent a little time in North Fork Wine country last week, visiting and reviewing the wines of Raphael, Roanoke Vineyards and Paumanok Vineyards. I also stumbled upon a somewhat new blog written by Tim Martinson of the Cornell University Cooperative Extension. Last week I had the pleasure to attend the grand opening of the Watkins Glen Harbor Hotel which has been in operations since July. The hotel is located on the waterfront in the Village of Watkins Glen with a commanding view of the deep blue waters of Seneca Lake as it stretches north from its southernmost point. The hotel staff was kind enough to give me a tour of the facility and some of the rooms. The decor is striking throughout, with strong elements of wood and stone. The rooms invoke what I would call a New England coastal theme with light wood floors, white trim, tones of blue, and an airy atmosphere framed by multi-paned windows and sliding doors between rooms. The presence of a large body of water and the shrieking of seagulls reminds the visitor that this theme is not only workable but in many ways accentuates some of the qualities of the region that are often overlooked. Yes, the Finger Lakes can in some respects be a coastal destination. Watkins Glen is located near many wineries and a popular NASCAR race track that holds a variety of events throughout the year. There is also a state park right in the middle of the village that has one of the most tremendous gorges in the Finger Lakes region. A train line originally built for the salt industry (the Finger Lakes has some of the biggest underground salt mines in the world) runs around the waterfront and can carry tourists to various destinations. Despite these attractions, Watkins Glen has remained a sleepy village that has struggled with its transition from an industrial to a tourist economy. This hotel, located on the site of a former jelly factory, is one of many new improvements to an area that is poised to become just as much of a destination as Canandaigua and Geneva. The hotel takes advantage of its waterfront location and its event rooms, restaurant, and bar are located along a large open patio that has a fire pits for warmth on chilly evenings. The reception was laid out beautifully and the food was nothing short of delicious. The available wines were, of course, all Finger Lakes. While there are some nice places to stay in the Finger Lakes, including some bucolic and very authentic inns and bed and breakfasts, there are hardly enough high-end hotel rooms to accommodate a growing interest in the region. The room and the grounds at the Watkins Glen Harbor Hotel would please any worldly traveler and the hotel will undoubtedly provide some needed facilities for all kinds of visitors and events. The hotel has full concierge service and the staff assured me that they will go to any length to ensure that a Finger Lakes visitor has a full regional experience. The rooms at this hotel are not cheap and the prices might not appeal to those who are used to paying the average hotel price in Upstate New York. If, however, you are looking for a Finger Lakes vacation that includes a spectacular room, a great view, and fine dining, the Watkins Glen Harbor Hotel might be the place for you. Please join me in welcoming Melissa Dobson as LENNDEVOURS' newest contributor. You may know Melissa from her blog Family, Love, Wine, but I know her as a wine lover and aspiring PR consultant who is based in the Finger Lakes. Since moving to the Finger Lakes with her husband, she has become passionate about the emerging wine region and has jumped in to become an additional ambassador for the local wine industry. Her PR experience includes a stint at Deutsch, Inc. in Manhattan on PR teams that included Samuel Adams Beer, 7UP PLUS and Snapple. 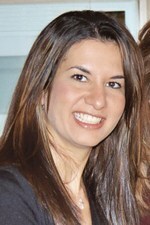 While in New York City, she discovered her love of following trends and thought leaders in the wine and culinary industries. Here on LENNDEVOURS, she'll be focusing primarily on Finger Lakes news and also chip in covering events when our other Finger Lakes contributor can't attend. International Riesling Foundation: What's the Point? When I first got the press release announcing the International Riesling Foundation's (IRF) newly proposed Riesling Taste Profile, I didn't give it much thought. It seemed a bit frivolous to me. Just another act of oenological masturbation -- only satisfying or useful for one or a small group of people. I dismissed it really. But then I started seeing more and more coverage of it. Sure, the stories read an awful lot like the press release I got, but I'm still left asking "What is the point?" The concept is simple enough and on the surface it makes some sense. 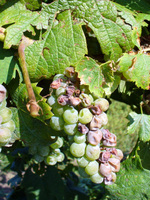 The IRF has identified four 'styles' of riesling: dry, medium dry, medium sweet and sweet, and to help wine makers consider which terms to use for various wines, the committee developed a technical chart of parameters involving the interplay of sugar, acid, and pH which "helps determine the probable taste profile of a particular wine." They have also designed labels (examples here on the right) that producers can put on bottles of their riesling to help consumers, I assume, predict how a wine will taste... at least in terms of sweetness vs. acidity. Medium Dry. Here the ratio is 1.0 to 2.0 acid to sugar. Example: a wine with 7.5 grams of acid could have a maximum sugar level of 15.0 grams. And if the pH is above 3.3, it moves to Medium Sweet, and if the pH is as low as 2.9 or lower, the wine moves to Dry. Medium Sweet. The ratio here is 2.1 to 4.0 acid to sugar. Example: a wine with 7.5 grams of acid could have a maximum sugar level of 30 grams. And again, the same pH factor applies as a level two wine: if the pH rises to 3.3, you move up to Dessert, and if the pH drops to 2.9 you move to Medium Dry. And if the pH is 2.8 or below (highly unlikely), the wine could be called Dry. Sweet. Ratio above 4.1, but using the pH adjustment, a sweeter wine with a ratio of, say, 4.4 might actually be moved to Medium Sweet if the pH is significantly lower. I'll admit that I'm not as technically savvy as I'd like to be when it comes to wine, but I'm not sure that pH should have so much weight here. Maybe a winemaker or someone else in the industry can help clarify for me. Welcome to the 49th edition of the original virtual wine tasting event, Wine Blogging Wednesday, hosted by 2 Days Per Bottle. "What will you drink to toast the end of the Bush era? Will it be something to honor the 43rd President, or are you just looking forward to 44? Will it be something from Texas, which Bush calls home, or Connecticut, where he was really raised? Maybe a nice French champagne, a bit of a poke in his eye? Or do you prefer Italian prosecco, since they supported the “War on Terror”? Whatever it is, get ready to lift a glass and toast the end of an era that America will never forget." It's a politically charged edition of WBW to be sure, but it's also a fun one. I know that I'm ready for the teetotaling dummy to be out of the White House, after all. But what wine to choose? I do have a few bottles of Texas-grown Tempranillo down in the cellar. I also have a bottle of blended white wine from Arizona, a state represented in the upcoming election. But that's just not my style now is it? It's in a blue bottle and I live in a blue state. I tend to vote with my fellow New Yorkers too. 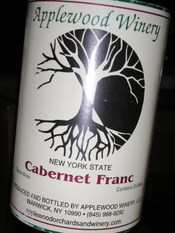 It recently won the "Governor's Cup" as the top wine at the New York Wine & Grape Classic. There's a governor in this election too, no matter what you think of her. I tend to drink a lot of Finger Lakes riesling. I thought it was time for a change. That sounds familiar too, right? So those are the whys...but how was the wine? Quite good actually. In the glass, this wine is extremely pale, nearly colorless with only the slightest yellow tinge. Expressive peach, orange blossom and pear aromas are enticing and somewhat riesling-like. On the palate, it's heftier than a riesling. There is some sweetness (1.6% RS) but it's balanced with fresh acidity. The flavors match the nose almost exactly, but with a little minerality and a hint of orange zest on a surprisingly long finish. In my opinion, it's a far cry from New York's best wine, but it's probably the best vidal I've tasted. Just a quick update about the first LENNDEVOURS Wine Bar event at Roanoke Vineyards on Sunday, October 19 at 2 p.m. We've sold a surprising number of tickets already, and we hadn't even announced the charity involved...until now. I'm thrilled to tell you that we'll be donating all of the net proceeds from ticket sales and the money we raise raffling off wine to Peconic Land Trust, an important local organization that strives to protect Long Island's working farms, natural lands and heritage. When: Sunday, October 19 from 2-5 p.m.
Why: To enjoy some delicious wine with great people and raise money for charity. Tickets are $10 when purchased in advance (call 631.727.4161) or $15 at the door. That ticket gets you the opportunity to preview two unreleased wines: Roanoke Vineyard's 2005 Gabby's Field Cabernet Franc and Lieb Family Cellars' 2007 Pinot Blanc. We'll also have Mediterranean-style food to nibble on, discounts on wines by the glass and by the bottle, raffles for Roanoke Vineyards library wines and some 'Sonis Cellars (my own label) wines too. I plan to do some live blogging at the event and will also be recording some video as well. I can't tell you who yet, but there is also a very good chance that a prominent wine industry member (not from Long Island) will be in attendance as well. This is just the first of what we hope will be a quarterly event. Best of all, net proceeds will go to charity each time. 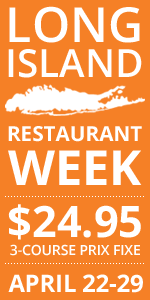 Space is limited, so call 631.727.4161 today and buy your tickets today. Riesling gets most of critical attention in the Finger Lakes, and with good reason. There are many world-class rieslings coming out of the region. 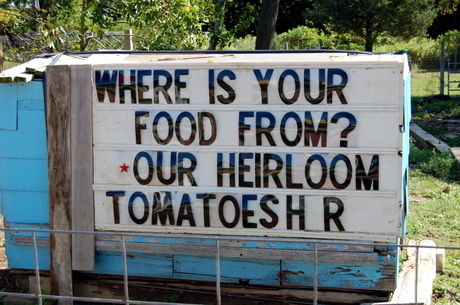 But it's not the only variety that thrives in that cool climate. The aromatic Gewürztraminer grape is another variety that, in the hands of the right winemaker, shines in the Finger Lakes. Penguin Bay Winery and Champagne House, located on Seneca Lake, opened in 1997 as a sister winery to Swedish Hill Winery, which was recently named "Winery of the Year" at the 2008 New York Wine & Food Festival. They focus largely on sparkling wines (sorry, I can't bring myself to erroneously call them champagne), but also make chardonnay, riesling, Gewürztraminer and some blended wines. 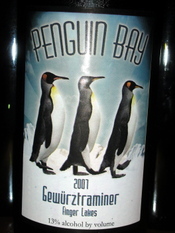 I haven't had very many of the wines, but this Penguin Bay 2007 Gewürztraminer ($18) really impressed in a recent tasting. Unlike many Gewurztraminers, the rose-petal quality isn't overpowering here, on the nose or on the palate. Instead, the nose presents ripe pear sprinkled with ginger, clove and allspice. There's a light floral quality, but it's in the background. The broad, flavorful palate is dry (.3% rs) and spicy with flavors that closely match the nose. The finish is a little short, but ends with a clean, gingery note. There's also just the right acidity here, not too little, not too much. Don't let the cute animal label fool you, this is a well-made, serious wine. This summer has tested vineyard managers throughout Niagara County, NY with rainy, humid and sometimes dangerous weather patterns. Hail fell from the sky at least three times, which made many in the industry rethink their expectations for their crops this year. I’ve read several reports on bad weather in Bordeaux, Burgundy and even on this site about Long Island, so it’s not all that surprising that our cool climate in the Niagara region wasn’t spared. I walked through Martin Schulze’s vineyard after the last hailstorm and the damage was obvious. Interestingly, Schulze Vineyards has a few east-west running rows that saw little to no damage at all from the hail. At Freedom Run Winery and Vineyards in Lockport, where the photo at the beginning of this post was taken, there was minimal damage because the couple of hailstorms they had were earlier in the season before the grapes were tender and susceptible. Like all farmers, grape growers must take what Mother Nature gives them and press on. Nobody is still talking about last month’s weather, as they’re all looking forward to the coming harvest. And speaking of harvest, I got to help out Freedom Run last week for the harvest of their champagne clone pinot noir grapes. With their sights set on creating a Blanc de Noir, the weather didn’t ruin the plan, as the sugar and acid levels were ideal for bubbly. Last Saturday, several members of the LENNDEVOURS Vintners Group descended upon Sannino's Bella Vita Vineyard for one of the most exciting parts of our winemaking project: bottling. It may not be glamorous work, but it means that you get to take your wine home from Long Island's only homewinemaker's center. This is the group, and the Sannino's bottling either our merlot or our meritage-style blend. That's me in the black Steelers hat of course. Sorry for the relative blog silence (maybe we can call it blog quiet this time? ), but I've been extremely busy at work, which has led to more working during the evenings. The major project we're working on should be released soon, so expect a return to regular blogging soon. Jamesport Vineyards has launched a new wine club with two options -- 4 bottles per month or 4 bottles every other month. I've mentioned it previously, but Fox Run Vineyards was named one of the world's top 100 wineries by Wine & Spirits Magazine. Look for the story in the November issue. Wine 2.0 is happening this Thursday at Webster Hall in Manhattan. I'm a wine blog sponsor for the event, but (unfortunately) I won't be able to attend. The third edition of Twitter Taste Live, a live online wine tasting enabled to Twitter, is this Thursday too (and there will be a live version at Wine 2.0). I'll be participating in this event founded by BinEndsWine.com from my house as we taste four wines from Michel-Schlumberger. You call follow the action by following me on Twitter. Good news – I passed the Unit 3 exam! Friends have asked if I’m excited, but mostly I’m relieved. (Also slightly shocked that I passed the tasting portion.) Now I need to go through the same drill for spirits and sparkling and fortified wines and write four research papers. Piece of cake. Many thanks to Lenn for giving me the real estate on his blog – and thanks to all of you who wrote in with words of encouragement and support. Whoever thinks the blogosphere is full of only snark and vitriol has clearly never visited this blog. I hope to meet some of you kind folks in person at the LENNDEVOURS Wine Bar event on October 19. Just don’t expect me to say anything remotely smart about wine, as I think I’ve forgotten it all. Hurricanes, and their remnants, are a hazard that very few wine regions need to worry about. But as harvest approaches each season, Long Island vineyard managers and winemakers always have an eye set on tropical systems as they develop in the Atlantic and build steam in the Caribbean. Sometimes the can, and do, make their way north and the results can devastating. Growing fine wine grapes on Long Island is a delicate balancing act. Growers are always trying achieve the most ripening that the growing season will allow—trying to eek out every last bit of sugar—while ensuring that they get the fruit into the winery before it is lost to any number of maladies including birds, deer, frost and disease. It's not surprising then that as hurricane-turned-tropical storm Hanna moved up the east coast last weekend, the local wine industry was concerned. Would soggy, drowning rains burst just-ripening berries? Would 70 mph winds destroy canopies, shutting down the vineyard's sugar-making machines? No. Local wineries were lucky. Most areas received two inches of rain or less last Saturday, and ample sun and drying winds the next day cleaned everything up quickly. 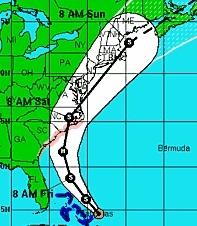 Luckily, we seemed to have dodged that hurricane as well. And even though harvest has started, with some wineries picking pinot noir for sparkling wine already, all the local wine industry can do is keep a collective eye on Ike, Josephine and those storms still unnamed as they let the rest of their grapes hang on the vines into October and even November. Everyone seems optimistic that 2008 can be a classic vintage, but no few will say it. No one wants to taunt Mother Nature and her storm-delivered wrath. Here on Long Island, the influence of Italians and Italian-Americans is felt throughout wine country. Winery names like Castello di Borghese, Pellegrini, Pugliese, Scarola, Medolla, Christiano, Diliberto and Macari put that heritage front and center. In the Finger Lakes, the Italian influence seems a bit less obvious. Being further away from Italian-heavy sections of New York City is probably partly to blame. But, Michael Litterio, owner of Villa Bellangelo on the western side of Seneca Lake, is bringing Italian flavor to Finger Lakes wine. He's from New Jersey by the way. His wine portfolio shows a definite leaning towards Italy while (mostly) staying true to what the region does best, with riesling, gewurztraminer, pinot grigio and blends like Bella Bianca and Francesca Rossa. He also makes a Sangiovese that is labeled as "Americano" so the grapes probably came from California. This riesling, from a 2006 vintage that is considered quite good for the variety, pours a pale lemon yellow. Lemon, lime, sweet herb, light floral and faint honey aromas mingle on the nose. ON the palate, it's fruity up front with fresh-squeezed citrus and honeyed pear flavors, but the residual sugar (2%) isn't quite balanced out by the gentle acidity, leaving the wine a bit flat and cloying... particularly on the finish. On the morning of Friday, August 22 the Finger Lakes Wine Alliance hosted a closed tasting of winemakers and critics at Sheldrake Point Vineyards on Cayuga Lake to determine which Riedel glass best exhibited the flavors and nuances of Finger Lakes Riesling. Later that day, George Riedel continued his tour of the Finger Lakes with a public tasting at Glenora on Seneca Lake to see whether a mixture of wine enthusiasts and reporters -- including me -- would come to the same conclusion as the group of winemakers. I approached this public tasting with an open mind, having never compared different Riedel glasses while drinking the same wine. I left with a mixed opinion but a new appreciation for the importance of stemware as part of the enjoyment of wine. 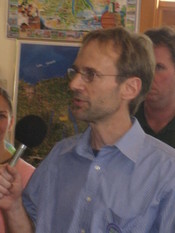 George Riedel opened the event with a summary of why he was in the Finger Lakes, a region that he feels is similar to the Riesling-producing regions of Europe. In a line that will be oft repeated by those in attendance, Riedel joked that "it is easier to find wine than gas" in the Finger Lakes, which is in fact quite true. Overall, George Riedel made the audience feel as if he saw a great deal of potential in the rural but dynamic and emerging Finger Lakes wine scene. The tasting, which Riedel led the group through sniff by sniff and sip by sip, was relatively simple. Before each participant were seven glasses laid out on a Riedel tasting mat, pre-arranged by the Riedel staff. The first glass, on the left, was a small plastic cup. The rest were Riedel stems of various shapes and volumes spread out like a fan and located on their specific circles within the paper mat. We tasted three different wines, and after each tasting the audience voted for their favorite glass which was the one that brought out the best flavors and nuances of the wine. The Rieslings, tasted in order, were the 2006 Knapp Reserve, the 2006 Glenora and the 2006 Sheldrake Point. As the tasting progressed, I could detect through rounds of sniffing and tasting the qualities that the different glasses brought out in the wines. Some glasses provided more acidity, while others highlighted fruit, and some others minerality. In the case of each wine, the glass that seemed to curry the most favor with the participants was the one that balanced all of these elements. In every round, glass no. 5 earned top honors, eventually winning the overall vote at 34. Glass no. 4 was a close second, earning 28 votes. On all but the Sheldrake riesling, I felt that glass no. 5 was the most appropriate choice. A later harvest Riesling, the Sheldrake had a higher residual sugar and a touch of botrytis which made it an unusual but interesting example to test against the prevailing glass. Glass no. 5, officially known as Riedel #446/15 from the Restaurant collection, was also the primary selection of the Finger Lakes winemakers from the morning tasting. It seemed that this particular glass was an overwhelming favorite for highlighting Finger Lakes Riesling based on these two tastings. George Riedel explained that smell contributes as much as 80% to the sensation of taste in our mouths, and if one accepts that premise then it is easy to see how the shape and thickness of glassware can manipulate or enhance the flavors we associate with wine. I smelled and tasted distinct notes within each glass and nearly all seemed distinguishable from one another. Of the six glasses before us, each added or detracted from the wine in a different fashion. The small plastic cup was dead and lacked all character. Yet, while I felt that I smelled and tasted radical differences based on the glasses alone, any psychologist in attendance would have been able to note the allure of the "show" being performed before us. George Riedel spoke quickly and confidently through each and every glass, suggesting his own interpretations of what he detected on his nose and palate. Almost from the beginning, I assumed that the glass we chose would come from the geographic middle of the controlled lineup, which it did, and would neither be the tallest or shortest glass, which it was not. Beyond these reservations, I walked away convinced that glassware does have a huge effect on taste. For instance, I never considered how the shape of a glass makes us tilt it way back, a little, or not at all to engage our olfactory senses, and I believe that many variables like this contribute something to our wine experience. How could they not? I am not prepared to spend a fortune on Riedel glassware, but I must admit I am intrigued by what I smelled and tasted under the direct guidance of George Riedel, who was kind enough to let us depart with our tasting set. I am planning on repeating the experiment with some innocent victims in the near future to gauge a reaction sans the heavy promotion. As for glass #446/15, there is no firm plan yet as to how Riedel will market its new association with Finger Lakes Riesling or how the Finger Lakes itself will embrace the piece. Bob Madill of Sheldrake Point, chair of the Wine Alliance and conceiver of the Riedel visit, considers the glass "a quality symbol that re-enforces our experience and projects Finger Lakes Riesling as a world class quality wine." He plans to begin presenting his Riesling in this particular stemware to enhance the opinion of special visitors and critics. Others may choose to do the same. George Riedel is a businessman who sells very expensive and well-made stemware. That being said, he seems sold on the Finger Lakes as a good investment, which says a lot about the growing profile of the region. Whether or not you believe in the Riedel experiment, there is little doubt that the Finger Lakes and its Rieslings are being taken more seriously by the wine industry as a whole. 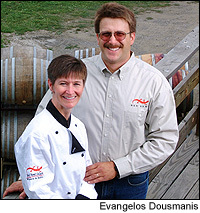 Applewood Winery, located in Warwick, NY, was founded in 1993 by Jonathan Hull, who serves as winemaker. Hull makes apple wine, hard cider and also more traditional wines, including this non-vintage cabernet franc. I'm not sure where the grapes were grown. It's labeled under the New York State AVA, so it could be most anywhere. I also haven't been able to track down information on the vintages that went into this wine. Light-to-medium garnet in color, it's slightly opaque in the glass. The nose isn't overly expressive with only the lightest plum and blackberry aromas, and just a little oaky spice. The light plum and blackberry character carries over to the palate here with raw-tasting oak on the mid-palate that brings a little vanila with it as well. The palate is medium bodied, with medium tannins. The finish is short and overall, and this wine wasn't identifiable as cabernet franc when tasted blind. My guess is that the fruit came either from a lesser vineyard location or from a wet year (2006? ).